Supporters of stronger gun control measures stepped up their campaign this week for stricter gun laws. The Washington Post reported that gun control advocates were holding more than 140 public events in 29 states on Thursday to press senators to support universal background checks. A Pew Research Center survey in January had found a wide gap between those who prioritize gun rights and gun control when it comes to political involvement. 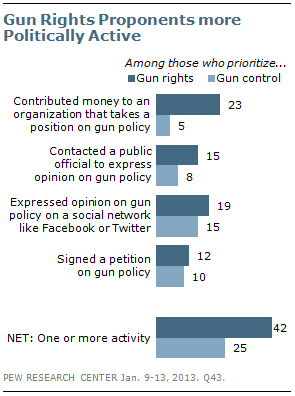 Nearly a quarter (23%) of those who say gun rights should be the priority have contributed money to an organization that takes a position on gun policy, compared with just 5% of those who prioritize gun control. People who favor gun rights are also about twice as likely as gun control supporters to have contacted a public official about gun policy (15% vs. 8%).